It is hard not to be enthusiastic in describing the AM68 after our test, considering the excellent all-around performance of this outstanding craft (50 knots maximum speed, 40 knots cruising speed with two 2 MTU12V183 TE 92). It is unusual even for us to plane on the sea at this speed with such comfort. AM 68' was always settled , exploiting the engines' power to the outmost and in all the different conditions, and we hence were fascinated by its unexpected navigating comfort and excited by its great steering precision. It certainly is a craft designated to sportsmen and speed-lovers, perhaps a little exhibitionist as well: the manufacturers paid great attention both to styling and extremely sophisticated construction systems (kevlar-carbon), ignoring the luxurious finishing touches, often demanded by the owner, that we are used to seeing on boats this size. Why not treat with high end quality products boat owners seeking those strong emotions that this boat definitely gives? For this reason we greatly appreciated Renzo and Sergio Marchi's Arredomar who courageously dared to invest in this boat lots of constructing technology. Personally we hope that it will find equal consensus here as it did abroad, where it has already been bought with great enthusiasm and confidence by a young businessman from New York. So, a cordial "With compliments" to the buyer and a sincere and affectionate "bravi veci" to Renzo e Sergio Marchi, and all their valid staff. Price with standard specification and 2 1.000 MTU 12183 TE92: as for the peculiarity of construction, the boatyard prefers to have a direct approach with the potential buyer to treat with the commercial aspect of the sale. 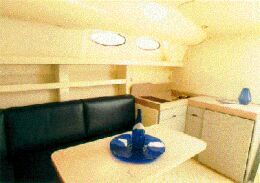 Layout and specifications: bow owner's stateroom with double berths, drawers, lockers, en-suite owner's heads with shower, guests' heads en-suite with shower, saloon with facing double dinette, coverable galley, working furniture, electric system control panel, upholstery in washable fabric; heads shelves and gratings in corean with folding covers; upholstery to the owner's choice. Below decks steering position: double anatomic settee in the cockpit; wheel (Momo), controls and complete engine instruments, compass, radar, GPS Navigraph Trimble, eco-sounder, log, VHF . Galley area: coverable, in the dining area 120 lt. fridge + sink in corean, worktop, double burners, food locker, drawers and lockers. 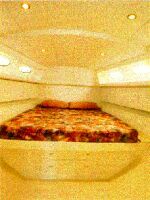 Standard equipment: air conditioning, Hi-Fi stereo, 15 kW generator, 2 boilers, TV with VCR. Optional equipment: bow crew cabin with own heads. Deck: the original design and the advanced technology make the AM68 a very sporty and fast craft, but with the drawback of the poor accessibility of the foredeck.